I remember the wind blowing through my hair as I rode my horse along Wonder Bay Beach. The salty air clung to my nostrils as I breathed in the misty air. 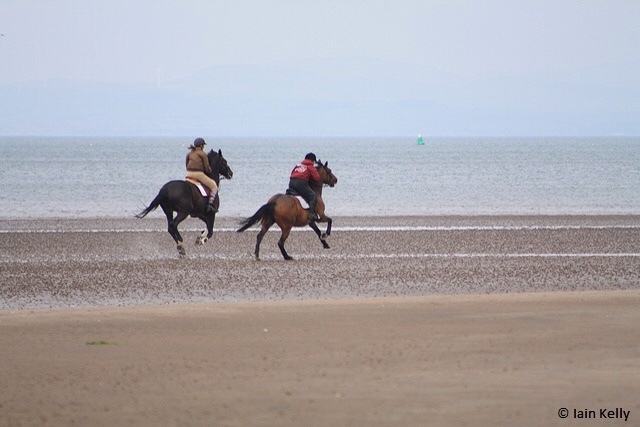 My horse galloped along the sandy beach as I laughed at the feel of complete freedom. Jake was by my side on his horse and we found ourselves racing to the end. The seagulls called in the air and we enjoyed the privacy of the beach to ourselves. This memory is engraved into my mind. Jake left for war one week after this and I never saw him again. Thank you Iain for our photo prompt this week! This is my 100 word submission for the flash fiction challenge, Flash Fiction for Aspiring Writers. We are given a photo prompt and approximately 75-175 words with which we create our stories. This week we are gifted with the photo from Iain Kelley. 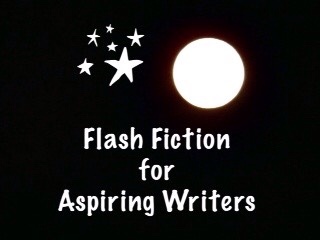 This flash fiction is a lot of fun and everyone is invited to participate. For more information, click HERE. The vivid description of the beach entices. And then, the clue in the last sentence – why is the memory so vivid? Superb! A beautiful sentiment, PJ, very well done! Thank you so much, Terri! I hope you had a wonderful Christmas. Awww, so bittersweet, a precious memory! Good story. Excellent story PJ, with a tragic ending. It does look like they are having a great time in the photo, good to have a happy memory. Thanks Iain! They are having a great time and therefore she has a good memory. Thank you so much for the great photo! I sadly wonder how many this has happened to…. ? Vividly depicted PJ. Thank you so much Jodi! I’m afraid this same type of thing has happened to many, sadly. Very sad but lovely memories to hold on to. My nose twitched at the salty air and the heart break of it. Well done Priceless. Vivid description and sad ending. Great story! You are right Michael. This same type of thing happened to many – sadly. Thank you and Happy New Year’s to you too! Too many times, that can be a truth…. Well done. Yes, indeed! Thank you Roger! Thank you so much Mandi! I hope you had a good Christmas and plan on having fun on New Year’s Eve. I have been wondering about you. I don’t get your posts anymore and I know I didn’t stop following you. Are you not posting? Hmmm, that’s strange PJ. I’m still getting your posts and I follow you? Maybe you accidentally unfollowed me? It’s http://www.mandibelle16.wordpress.com in case that happened. I’ve been pretty good keeping up with my blogging. Not as much as October Poetry Writing Month or November Notes poetry challenges but I do some flash fiction and prompts off of MindLoveMisery’s Menagerie. Let me know if you still aren’t getting my posts. I posted a Shadorma poem today. And I’ll try to figure it out! Christmas has been nice. I did a lot of baking preparing snacks for Christmas Eve and I’ve been trying to get together with some friends while they’ve been off work. Im going to a games night/New Years Eve party and looking forward to it! Hope you are doing good as well. How did you spend your Christmas? Did you get to visit your family or have them over? Sounds like a lot of fun going to a game and party on New Year’s Eve! Also sounds like you had a very nice family Christmas. I wasn’t with my kids on Christmas. My sister and I went out to eat on Christmas Eve and again on Christmas Day. It was very quiet and very nice and we both enjoyed the food and company. And, we exchanged gifts with each other. I promise, I did NOT unfollow you. Suddenly, your posts just stopped appearing in my email. I didn’t think much of it because of the holidays. I thought you were either really busy or went out of town. I will have to check with WordPress and find out what has happened to your blog posts. Hopefully, they can straighten it out. I wish you the very best and Happiest New Year! Thanks PJ. Lol. I wish I was going to game but no we are just playing games different card and board games with our wine and other drinks and snacks 🙂 I imagine a couple card games called Cards Against Humanity and Apples to Apples. But I wasn’t sure if you’d heard of those games. It will be a fun New Years and yes Christmas with my family was great. Glad you gave your sister near to spend time with and exchange presents. Also nice that neither of you cook but go out instead. I’m not sure, maybe my emails are going to junk or trash? I made sure just now I was following you. I love WordPress but the little things it does at times are so annoying lol. That sounds like a lot of fun! A games party! I hope you have lots of fun! I have a feeling that you will. It should be a riot! I love playing games! It’s my bedtime so I will talk to you again soon. I hope you are feeling well and are doing much better with your health! Thanks PJ. I’m managing it. After I get over the initial darkness at this time of year, it’s usually pretty good. Hope you are well too. Sleep well. Thank you Mandi! Does it stay dark most of the time in the winter there like it does in Alaska? No not quite. Up in Alaska, and Canada’s Yukon, and North West Territories, it will be dark all the time for quite a few months. They are much closer to the North Pole up there. In September in Alberta, we notice the nights getting shorter. In mid-summer it’s 11:00 pm when the sun sets but by December 21 when Winter officially begins. It’s the longest day of the year and pretty much 4:30 pm when the sun actually sets. Not to mention if you are working and have to get up for say 7 am to get to work, the sun is rising later, so by November/December you are getting up in the dark, and going home in the dark. We don’t much notice right away that after December 21, the days are slowly getting longer again as we slowly have more daylight. It will probably be the end of January before people notice this more and are not going home from work in the dark or that your average person notices it’s actually lighter out in the evening. But it’s much better come from Feb and March I find for Seasonal Depression. Plus twice a year we have a time change? Do you guys do this? So in November in the beginning we “Fall behind” and gain an hour of sleep and in Spring we “spring ahead” and lose an hour of sleep but gain more daylight hours. It is hard at first in spring, but worth more sunlight. Not all Canadian provinces do the time change, but we do in Alberta. It’s about 5:30 pm when it becomes dark here, but like ya’ll, once winter solstice is over, we start gaining daylight again. Yes, we are on daylight savings time during the summer too. It is usually around 9:00 pm that it gets dark here in the summer. Sad, but what a great memory to hold. Yes, that is very true. As sad as it is, she has a wonderful memory. A beautiful story even if the end is sad. Thank you so much Brindille! Thank you for reading and commenting! the intro was so lovely, and I like the plot twist, it is so sad though .. Wonderful, but sad story.It would be so difficult to never know exactly what happened to him. She does have some lovely memories though. Thank you Deb! HAPPY NEW YEAR! I look forward to sharing those wonderful things with you too. 🙂 My partying tonight is to watch tv until 9:00 pm then go to bed. Hahaha! Yes I’m on Season 2 and there are 5 Seasons so it should keep me occupied for a while! If you could binge watch a tv show, what one would you love to watch? That’s great! I would have to say it would have to be something on Animal Planet. There are several I really like on that channel. They have those cutest kitty and cutest puppy shows, I love those!! Yes, those are cute too. I like Pit Bulls and Parollees and The Last Alaskans and the Yukon Men. (The only thing I detest on these shows are when they trap animals!) Ugh!! If I can get my dog to stay up later than 9:00 I would like to watch the new year come in but I doubt I can stay away that long and I doubt I can get Bria to stay up that long because she is very persistent about her bedtime. LOL! Lovely story on friendship and I think sometimes having that friend even though we had to let them leave us, the memory of the friendship keeps us warm on sad and lonely days. Happy New Year PJ and all the best for 2017! I have been away and look forward to joining the challenge in the coming year. Looking forward to an exciting FFAW from you! Good memories are important to our emotional health, Gina. You are right! I have missed you! I’m happy to hear that you will be participating once again in the weekly challenges. I just sent out a new one for this week, about 15 minutes ago. Happy New Year! I wish you and your family a wonderful blessing filled year! Thank you PJ! The months of November and December are too crazy for me as I do volunteer work around this time and make sure I spend time with family that visit. But I am already for the New Year. Your challenge has been the thing tat’s kept me sane some weeks! So I am so looking forward to getting back to writing. Thank you for your effort and dedication in hosting this lovely challenge! Ooops, sorry Gina. Two comments got blended into one and I think I sent a reply to you that should have gone to someone else. Please forgive me. I understand that you have been busy because life is like that – it sometimes gets in the way. I’m happy to hear that you are back and will be joining us once again. :)) Well, you are most certainly welcome, PJ, It is a pleasure enjoying them, so, Thank YOU!!! ps. Your stories sure seem strictly real in my imagination :)) thanks for always making us smile!!! LOL! Some of my stories certainly do seem real and would be very easy to think that they are. Thank you so much for enjoying them! Thank you, for sharing them!! !